Kevin Roberts is hoping for another crack at the FA Cup first round - but needs Halifax to get past Harrogate on Saturday first. The Town defender has played in the second round of the FA Cup as a second-half substitute for Cambridge against Sheffield United in 2013. He reached the first round proper for Halifax against Bradford in 2014 and is one of only three survivors at the club from that matchday squad, along with Richard Peniket and Scott McManus. Town also reached the first round last season but were thrashed 4-0 at home to Wycombe during Darren Kelly’s ill-fated reign in charge. 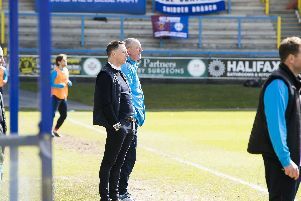 Roberts said: “The Bradford game was a big derby but it was disappointing in the fact that we took the lead but gave away a goal a few minutes into the second-half. “That then set the tone for the rest of the game. “It was almost a sell-out and it was a great atmosphere. Town were beaten 1-0 at home by Harrogate in the league earlier this season, with Saturday’s hosts sitting in second in the Conference North. “It’ll be a really difficult game,” said Roberts. “I remember that game at The Shay and we were really poor. “We’d played against Fylde on the Saturday and lost but put in a really good performance, but we just didn’t do ourselves justice against Harrogate. Roberts, who joined Halifax from Cambridge in 2014, said there were offers from other clubs over the summer, but nothing that turned his head. He was made vice-captain by Billy Heath for this season, and while the Town boss is a big admirer of the defender, for Roberts, the feeling is mutual. “He’s a top man manager,” Roberts added. “All the lads really like him. “He speaks to everyone and he’s very honest - if you ask any player what they want, it’s honesty. “The way he speaks to people - he tells you straight how it is.